Megan and Claude were delighted to be involved with the recent Game of Thrones photoshoot courtesy of Cocobella Bridal. 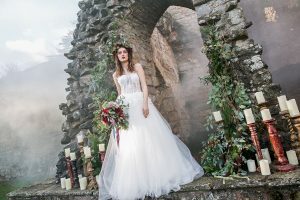 Take a look below at the pictures, and read our ideas on how to create your perfect gothic style Game of Thrones wedding day! Dreaming about a full Game of Thrones backdrop for your wedding day? Or just a few medieval touches to set the scene for a wolf-and-dagger romance? Megan & Claude can make it happen! Clearly it begins with the venue. For a hauntingly beautiful backdrop, we love Welsh castles like Manorbier and Caldicot. It’s simple to hire a van-load of chairs and turn anything into a venue, so if your heart’s set on a woodland clearing then go for it. Chair, my lady? The bride and groom will want something lordly to sit upon for their feast. That’s what our magnificent Gothic thrones are for… find a minion to drag them around for you while you recline in majesty, drinking from a goblet. Winter warmth. If your date is during the winter months then consider adding a couple of faux mink throws – excellent photo props that also prevent you from turning blue. *Is there a wedding theme you’d like us to cover on our blog? Please let us know. Don’t forget to follow us on Instagram and Pinterest for the latest wedding theme ideas!